The last analysis of the iTunes content store showed amazing acceleration in download rates. Since we know something about the pricing of apps in aggregate, we can make some guesses about the income from apps for both Apple and suppliers. Average selling price per app $0.29 (as reported in June 2010 here). 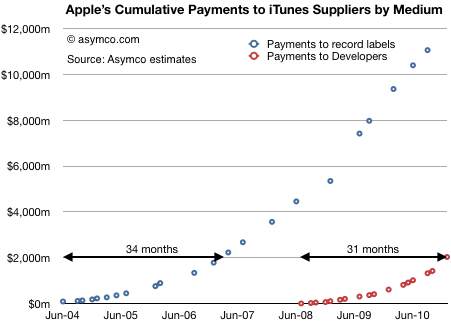 The first chart shows the accumulated payments made to suppliers of content to the iTunes store over time. Although the music suppliers received in aggregate much more than developers, the iTunes store has been open much longer. When comparing sales acceleration, the App store is ramping faster having paid out $2 billion in 31 months vs. 34 months for the first $2 billion paid out for music. My guess is that a follow-the-money analysis would show that apps as a medium will absorb talent and capital away from existing mediums and the industries they support. 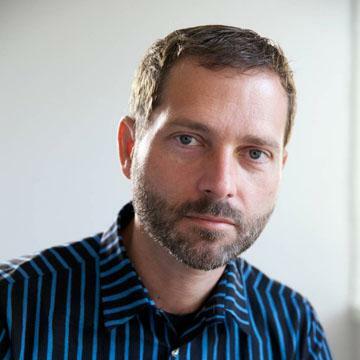 › Next Post How long before apps overtake physical video game content sales?